Does Your Sunscreen Protect or Harm? Summer is here and every mother and father are out there yelling “Don’t forget your sunscreen!” Does this sound familiar? I cannot remember the last time that we left the house or my child left the house without putting sunscreen on! Have you ever read the ingredients on the container of sunscreen? It is like reading a toxic list of chemicals! Ever think about this list and what is actually being applied to your skin? The Environmental Working Group did an investigation on almost 1,000 brand name sunscreens and found that 4 out of 5 do NOT provide protection and/or contain chemicals that could be a health hazard. Dr Cedric Garland, professor of family medicine at the University of California, and Frank Garland, director of Naval Health Research Center, have stated that “although sunscreen protects against sunburn, there is no proof that they protect against melanoma or carcinomas.” Dr Gordon Ainsleigh has also gone as far to say that “sunscreens cause more deaths than they prevent.” Various studies have linked sunscreen usage with high incidence of melanomas, birth defects, sterility, and uterine conditions such as endometriosis. Is it suspect that the countries promoting heavy sunscreen usage (Australia, USA) have the biggest increase in skin cancers? In Canada and Europe only three active ingredients are allowed to be sold as sun blocks; avobenzone (Parsol 1789), titanium dioxide, and zinc oxide. Avobenzone works by absorbing the harmful radiation from the sun, which it then released as damaging free radicals on the skin. Although radiation from the sun is known to be a carcinogen, free radicals create the breeding ground for cancer to develop. So while avobenzone claims to offer sun protection, it is actually promoting the growth of cancers and aging. 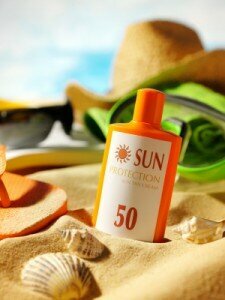 For broad spectrum protection, make sure the sunscreen contains at least 7% zinc oxide. Stay away from sunscreens with ingredients that include oxybenzone or bezophenone-3 – they are linked to allergies and hormone problems. Avoid, Avoid, Avoid tanning beds: the UV radiation can be as much as 15 times that of the sun! There are better sunscreens to choose from. Zinc oxide based sunscreens offer a healthier alternative. Zinc creams block the harmful UVA and UVB radiation instead of absorbing them and converting them to free radicals. A downside of zinc sunscreens is that they are more expensive. Application ease also ranges between products so if one doesn’t feel right then try another brand. Bottom line: Know what you are putting on your skin! It could save your life! If you’re making use of a tanning bed too often then you could possibly be putting yourself in serious harm. The over exposure to dangerous UV rays has been linked with skin cancer, and even though many men and women feel that tanning beds are safer than tanning in the sun, this is not constantly true.Should you own your own tanning bed, or you regularly use one at a tanning salon, then you can’t ignore the safety risks which are ever present when using a tanning bed.